The Bomb Cyclone of 2018 has kept me grounded in Atlanta and away from this year’s MLA Convention, where I was set to participate in the Graduate Student Futures session later this evening with higher education professionals of various stripes from the University of Arizona, North Carolina State University, College of New Jersey, and the University of Alabama, Tuscaloosa. In a way it’s fitting that my plans have changed. My contribution to today’s roundtable on employment opportunities for modern language PhDs centered on changed plans and sought to highlight (and rethink) the vast non-tenure track opportunities available to PhDs in higher education. I nodded to changing plans when I referenced Choose Your Own Adventure books in my session abstract , and I was even going to rely heavily on Jorge Cham’s PhD Comics “The Plans” to kickstart my presentation. “How many of you have been here before, with your advisors, family, friends, neighbors, in-laws, strangers on the street, pets, inanimate objects anthropomorphized just enough to convince you they are listening (my two-year-old has a room filled with plush creatures, all of them with enormous eyes), and certainly, ourselves? Yeah, you have a plan. Well, the academic job market has one for you, too, sweetheart. Finally, there’s the Secret Plan, that deliciously improbable dream scenario that we hold dear to ourselves, of becoming, as Cham suggests, each with increasing enthusiasm, a baker, rockstar, writer, and with some creative input from me—in shining lights—a higher education professional. Enough has been written about alternative academic (alt-ac) careers and leaving academia to help inspire a new genre: quit lit, and its more modern, social-media savvy cousin, #quitlit. As it’s gained momentum, the alt-ac movement has formed a track of its own, as the path for PhDs seeking opportunities in higher education beyond the tenure track. Less has been mentioned, however, about the possibility of hybrid academic positions, or the chance to engage in various kinds of higher education roles while maintaining a faculty appointment, and thus, a toe in the classroom and scholarly work. In my own experience, I transitioned almost immediately upon defending my dissertation in Hispanic Studies to a position launching a Spanish immersion program at a nearby liberal arts college, where I worked closely with faculty and marketing, admissions, and program representatives to develop, publicize, and recruit for the new program. This opportunity led to the next. In my current combined role at Emory University, I lead a multi-year grant-funded initiative in Emory’s Goizueta Business School MBA Admissions and hold an instructorship in the Department of Spanish and Portuguese, where I have developed and now teach the department’s undergraduate business Spanish curriculum. This professional hybridity has drawn on my academic preparation in language and cultural studies to advance my work at the business school and adjusted my scholarly interests to include languages for the professions pedagogy and topics of cross-cultural business communication and management. I merged my hybrid academic roles further earlier this academic year by developing a slate of cultural competency and language training sessions for MBA students studying business abroad. The transition from graduate school to opportunities in higher education has not been without its hiccups—I could fill a book!—, but for as long as conversations about graduate student futures remain integral to our profession, I encourage our discussions to shift from substituting one track for another, to exploring mutually-beneficial hybrid academic roles. In an age when departments from across the disciplines rely heavily on contingent labor and PhDs seek viable employment that will still allow them to contribute to their fields, hybrid opportunities would ideally satisfy both needs and, over the long-term, prompt university officials to think more expansively and creatively about potential synergies around the quad. I begin every class and workshop I lead with an image. It’s a painting, really–one I stumbled upon at the Four Seasons Hotel Miami, where I stayed once for work. I saw it out of the corner of my eye, in passing, on my way to the elevator, but paused to study it, drawn in by the painting’s bright colors and depiction of a bustling port. The painting, by Uruguayan artist Carlos Páez Vilaró, has served me well since I first saw and covertly snapped a picture of it, given that, in an image, it communicates the concepts I most hope to impart on my students, and demonstrates what I believe are three important steps towards cultural preparedness. Knowing another language, even at a rudimentary level, challenges the mind to understand, hear, engage with, and even see the world differently, and can help endear those who attempt to speak the language to those who speak it natively. Plus, in a language class setting, especially one like the business Spanish class I teach at Emory, mastering new and, at times, specialized vocabulary represents a core aspect of the classroom experience. I begin by asking my students how they think the painting represents the concept of language acquisition, to which they respond with the word aduana, or customs. Fitting for a business Spanish class focusing heavily on global commerce, right? It’s difficult to understand a country or region–or the world, for that matter–without a grasp of its current events, and in the case of my business Spanish course and workshops on Latin America, its business landscape. How the painting represents this important concept is less apparent but no less powerful. After a few awkward moments of searching someone will eventually raise a hand to ask what ANCAP, the text on the ship at the back and center of the painting, means. My response, that it is Uruguay’s state-owned petroleum company, initiates a longer conversation about the country’s economic trends, resources, and free trade agreements and alliances around the world. Steps One and Two would be of little use, however, if it were not for culture and its acknowledgement, exploration, and eventually, understanding. Cultural knowledge contextualizes how language is spoken, when, and why, and similarly, serves as a legend by which to map out how a country operates, when, and why. As a final stroke towards bringing Páez Vilaró’s painting to life, the students identify its cultural elements as the colors of the buildings and their close proximity to one another. They always mention the cat in the foreground and the cranes in the back, and the more observant among them will point out that not a single person appears in this otherwise active urban landscape. Despite having only traveled the distance it took them to arrive to class, the students already know that Uruguay–and more specifically its capital, Montevideo–is modern and urban, has an import-export driven economy, and is home to a large, state-run oil and gas industry. The painting may contain the three fundamental steps outlined above but is worth more than a thousand lessons. I had the pleasure of teaching 30 four to eight-year-olds at my daughter’s school about Venezuela on Thursday (10/26). The session ended with a popular children’s song, which Venezuela claims as its own, but is sung throughout Latin America. In A la rueda, rueda, not unlike Ring Around the Rosey, participants go around and around in a large circle but drop hands and lie on the floor, as if to go to sleep, at the song’s conclusion. Maybe it was the spinning, but my visit got me thinking about that famous image of an iceberg, the one used to explain culture in its many forms, with art, language, and celebrations commonly listed at the very peak of an otherwise enormous, mostly submerged mass. Those attributes hidden from plain sight–shared cultural beliefs and symbols, tolerance for the unknown, communication patterns, etc.–are often the most difficult to understand, and yet, the most crucial for developing cross-cultural understanding and partnerships. It’s tempting to stay at the summit, especially when exploring a culture deeply sends us into the unknown, takes time, and often begs us to reflect on our own cultural patterns and behavioral tendencies, as I’ve pointed out in previous posts. But its only by seeking out with curiosity how others–in neighboring cubicles, companies, or countries–view and react to the world, and why, that we’re able to see the iceberg in its entirety and navigate ourselves, and our businesses, accordingly. I’d like to think that my daughter’s classmates took their first steps towards understanding a complex and fascinating part of the world on Thursday, and that, with time, they too will take the plunge to explore the iceberg we encircled. I came across this Fast Company article recently (click image) with basic, but useful, insights for doing business in Latin America, with the crucial reminder that intercultural exchanges can serve as much as a mirror by which to contemplate one’s own culture as a window through which to view other ways of life. Language study, travel, reading, asking questions, and getting to know our fellow citizens–of the country and world–allow for the kind of intercultural seeing and understanding that few other experiences can provide. As for the rest of the article, I echo the author’s observations on prioritizing relationship-building with Latin American clients before getting down to business a la americana. Although simple enough in theory, this concept can be surprisingly challenging for we gringos to put into practice. More information on why that is, from each perspective, in an upcoming post. All the same, learning a new language inevitably teaches you a thing or two about your own language first. I see it happen all the time–my students of Spanish will say: “I had no idea that (grammar concept) existed in English,” or “is that really the etymology (of that word I use all the time without even thinking)? !” Ok, let’s be real–they would never say etymology, and only some would even know what that word means. The point is that, by learning another language, they actually start to learn and marvel at their own. That, in turn, helps to make them more careful, sensitive, and ultimately, more precise communicators, capable of reading words and the way they are strung together more deliberately. And that, alongside of cultural competence, tolerance for ambiguity, and calculated risk-taking, may be what’s so sorely needed in these days of babble and Babel. My house is quiet right now, actually quiet, with a sleeping husband and baby, and two lazy dogs who, luckily, do most of their barking during daylight hours. The house is quiet, and I’m still awake… with nothing to do. If it seems like I’m pinching myself right now, it’s because I am: ‘quiet,’ ‘awake,’ and ‘with nothing to do’ rarely overlap anymore. 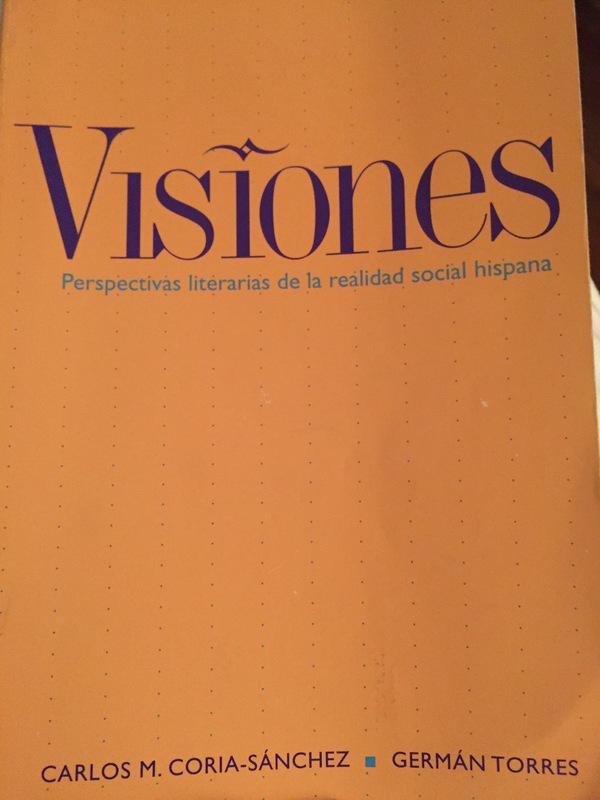 I’m also pinching myself reading “Visiones: perspectivas literarias de la realidad social hispana,” a literary anthology of Latin Amercan texts, all in their original Spanish, meant to breach the gap between traditional literary study and language for the professions courses. What’s novel about the anthology is not the editors’ proposal that students can gain insights into political, social, and economic themes through literature–outside of strict formalism, the study of literature has always allowed its subject to act as a window to other cultures and perspectives. Martha Nussbaum even suggests that literature cultivates empathy and instills in its reader the ‘moral imagination’ needed to act ethically within society. What’s exciting about “Visiones” is its implication that literature can enhance–and even provide a cornerstone for–language for the professions courses, which are sometimes considered more instrumental than conceptual in scope. Chapter themes like ‘Burocracy and Economic Corruption’ and ‘Attitudes Towards Foreign Investment’ are of real business concern and could just as easily appear in international business guides intended to equip the interested professional with brief insights into the region, best practices, and avoidable pitfalls. However, instead of providing the reader with readymade conclusions, the anthology’s curated literary sources encourage students to recognize and think critically about each topic, and ultimately discover trends common to the Hispanic world for themselves. If that’s not viewing language through a professional lens, I don’t know what is. At its most practical level, the study of literature hones students’ tolerance for ambiguity, begs them to think critically, and teaches them that what goes unwritten may be just as important, if not more so, than the words before them. What future businessperson wouldn’t want all of this, in addition to whatever cultural, political, or socioeconomic conclusions literature may also ask them to draw? And what person couldn’t benefit, now and then, from some time spent quiet, awake, and with nothing to do?